The Club took full advantage of the opportunity to celebrate its first 100 years in existence in 2009. It was also a great privilege to have the Alderman for the Ward, Ian Luder, holding the position of Lord Mayor of the City from November 2008, providing the Club with an opportunity to start its celebrations by having an entry in the 2008 Lord Mayor’s Show. Where in the City can all these be found within one boundary? 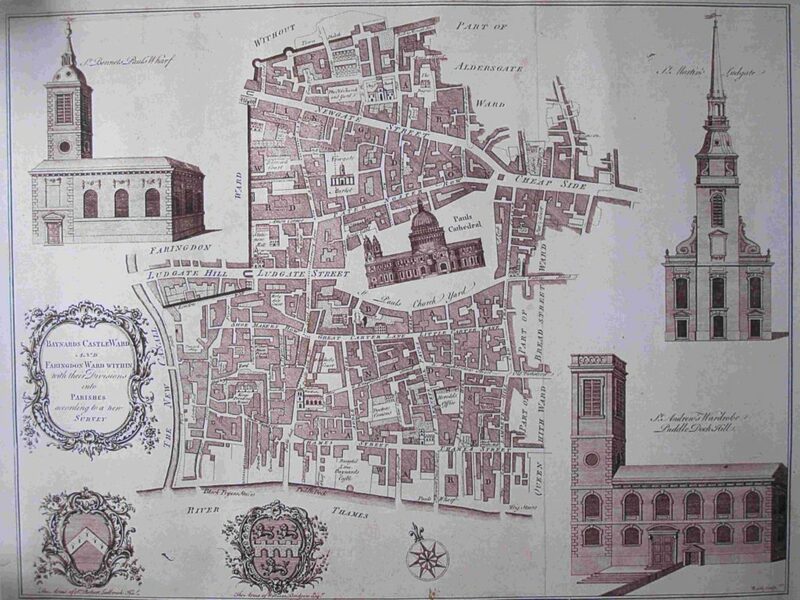 St. Paul’s Cathedral – St. Andrew-by-the-Wardrobe & St. Benet’s – Doctors Commons & the College of Arms – the Mermaid – ‘Seven Ages of Man’ & Blitz – the shades of Richard III, Edward IV, Henry VIII, Wolsey, Lady Jane Grey, Dean Colet, Shakespeare, Wren, Pepys, Nelson & Wellington – the Great Wardrobe and Puddle Dock – Knight Rider Street – St Bride’s Church – ‘the jovial Rising Sun’ – the ‘Punch’ and ‘Olde Cheshire Cheese’ pubs – nearby livery companies of the Apothecaries, the Stationers & Newspaper Makers. Where else, but in the Ward of Castle Baynard. Castle Baynard is one of the twenty five Wards into which for many centuries the 677 acres comprising the City of London have been divided. Wards are thought to have originated in Anglo Saxon times, when the community met together at Wardmotes to elect an ‘Eorlderman’ to represent them in the Government of the City. Today, the Wards elect twenty five Aldermen and one hundred members of the Court of Common Council. Since 1700, fourteen Aldermen of the Castle Baynard Ward have served the office of Lord Mayor. In a Deed dated AD 1111 reference is made to an Alderman of the Ward and the property referred to is identifiable as being within the present Castle Baynard Ward boundary. A few years later St Paul’s Cathedral and the Bishop’s Palace were within this boundary and it was described as the Ward of the Bishop and referred to as the ‘Premier’ City Ward. Ralph de Baynard who came over with William the Conqueror built the first Castle. In the reign of King John, the Castle was owned by Robert Fitz Walter, a Baron, but he was ordered to demolish it by the King. Subsequently he became leader of the Barons who forced King John to sign the Magna Carter. It was re-built to the east of the site of the first Castle by Humphrey, Duke of Gloucester, before he died in 1445. Edward IV was lodging there when summoned to be King in 1461. It was here that Richard, the succeeding Duke of Gloucester, assumed the regal title of Richard III in 1483 after murdering his two nephew princes in the Tower. The Castle was later occupied by Henry VII who again re-built it. Three of Henry VIII’s Queens lived at the Castle for a time – Catherine of Aragon, Anne Boleyn and Anne of Cleeves. 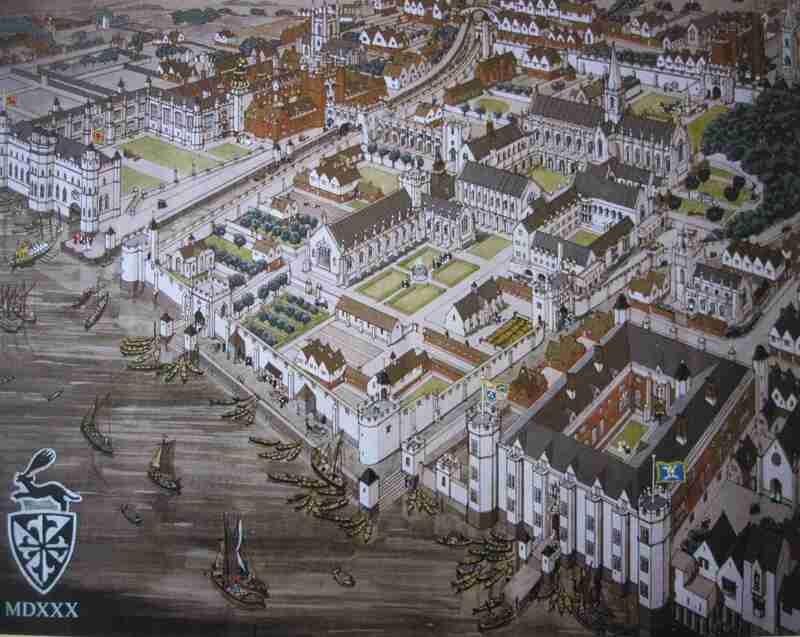 Queen Elizabeth I and Charles II are recorded as having visited there during their reigns. In the Great Fire of 1666 the Castle was largely destroyed and was eventually demolished at the beginning of the Nineteenth Century. The Ward includes the parish church of St Andrew-by-the-Wardrobe, whose name is derived from the King’s Great Wardrobe built in the Ward by Sir John Beauchamp KG and in which were stored the King’s robes used on state occasions. 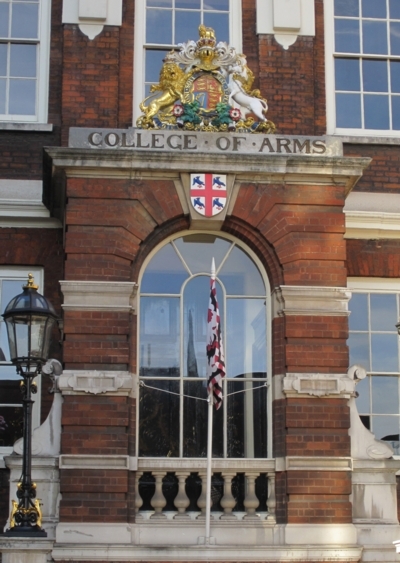 It also embraces the College of Arms, founded by Richard III in 1484, located in a fine building unchanged since the 1680’s. 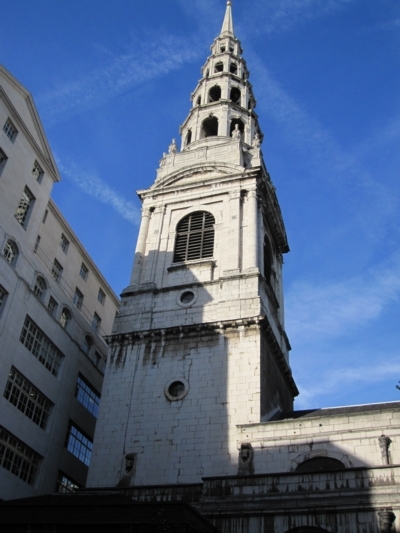 In 2004 the Ward was extended to embrace part of the Farringdon Without Ward area and now includes the historic parish church of St Bride’s and the sites of Bridewell Palace and the former Carmelite Monastery of Whitefriars. This map of Castle Baynard Ward and Farringdon Within Ward shows their divisions into Parishes, with a view of St. Benet Pauls Wharf, St. Martin within Ludgate amd St. Andrew by the Wardrobe. The survey is dated 1755. A map showing the current Ward boundary can be accessed at this location. This page on the Ward’s Common Councillors’ web site contains a contemporary description of the Ward. Each of the City’s twenty-five wards elects an Alderman and a number of councillors who sit on the Court of Common Council which is the main decision-making body of the Corporation of London. The Council meets on a regular basis addressing matters that are managed through the various committees and other issues and questions raised by its members. Communication is maintained with electors in the Ward through the holding of open surgeries called ward motes and through a regular newsletter called ‘Castle Baynard Contact’. Wren’s famous neo-classical masterpiece St Paul’s Cathedral on Ludgate Hill is the highest point in the City of London; it was designed by Sir Christopher Wren to replace the original Cathedral destroyed in the Great Fire in 1666. 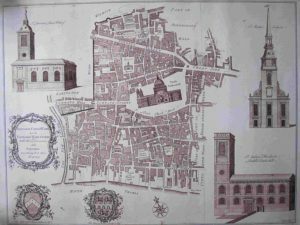 The construction was completed in 1708 while Wren was still alive and St. Paul’s is unique amongst historic English Cathedrals in being the result of one man’s creative design. 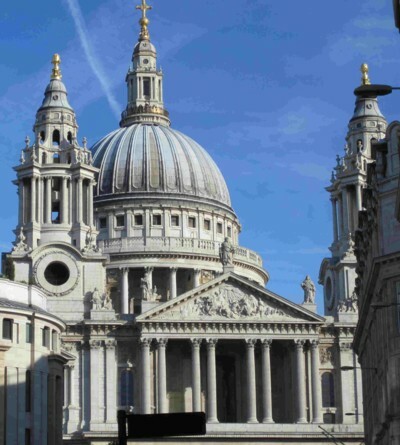 It is thought to be London’s fifth St Paul’s Cathedral, all previous buildings occupying the same site since 604 A.D. The cathedral is one of London’s most famous and recognisable sights. At 365 feet high, it was the tallest building in London from 1710 to 1962, and its dome is also the second highest and second largest in the world. The recently completed extensive cleaning programme has fully revealed the original splendour of the building. 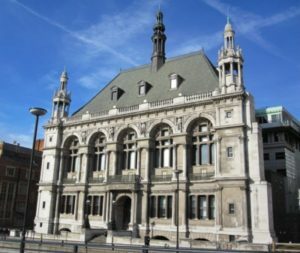 This building constructed in 1883 resembles a grand French chateau and was occupied by the City of London School between 1883 and 1987 before their move to the current premises opposite Armourers’ Hall. The front of the building houses statues of Bacon, Milton, Newton, More and Shakespeare.The building is now occupied by JP Morgan. A Grade 1 Wren Church designed by Sir Christopher in 1672 on Fleet Street to replace a previous church destroyed in the Great Fire. The famous distinctive tiered spire added in 1703 is reputed to be the inspiration for the design of multilayer wedding cakes. The church was badly damaged in 1940 during the blitz and was rebuilt with funding from the newspaper industry. Despite the exodus of newspapers from Fleet Street the Church is still the spiritual home of the industry. 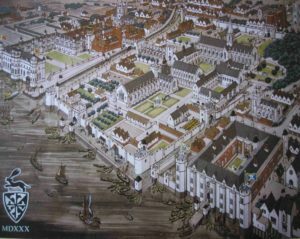 The Heralds’ College has occupied this site from 1555, the original building being destroyed in the Great Fire in 1666. Construction of the current replacement brick building now called The College of Arms commenced in 1670 and over the years the existing premises has undergone numerous alterations; the most significant being in the 1860’s when the wings were shortened to accommodate the construction of Queen Victoria Street. In 1956 the present gates facing Queen Victoria Street were erected, and in 2009 the building was damaged by a fire. Fortunately the damage was contained and the building underwent extensive repairs which were completed in 2010. 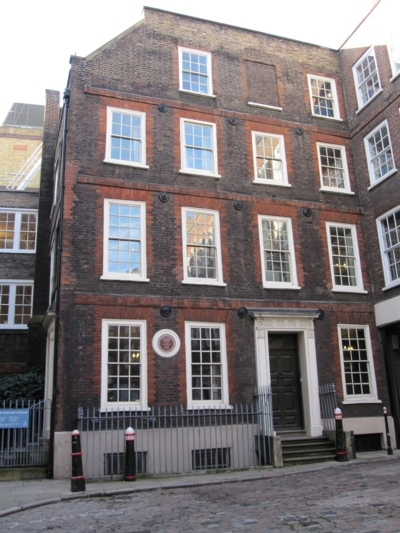 Located in Gough Square just to the North of Fleet Street is a former home of the 18th century English writer Samuel Johnson. Built in 1700, it is a rare example of a house of this era in the City. 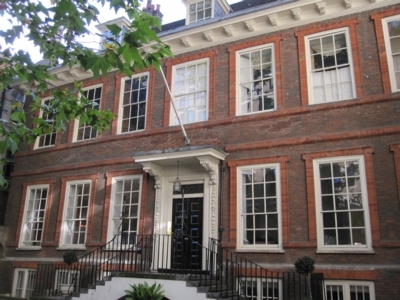 Johnson lived and worked in the house from 1748 to 1759, and he compiled his famous ‘A Dictionary of the English Language’ there. The house is open to the public. 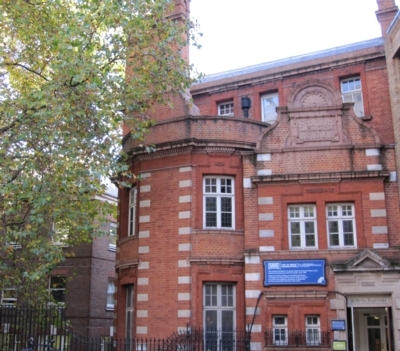 The building was completed in 1886, the building, designed by architect Sir Horace Jones, comprised a Common Room for Music Professors and 45 studios, each surrounded by a 1 one foot thick layer of concrete to ‘deaden the sound’. Each room contained both a grand piano and an upright piano. Additionally, there was an Organ room and a ‘Practice’ room, in reality a small concert hall which was used for orchestral and choir rehearsals. The ‘Practice’ room was also the venue for the fortnightly School concerts.The school vacated the site in 1977 to move to the Barbican, the building is now occupied by JP Morgan. 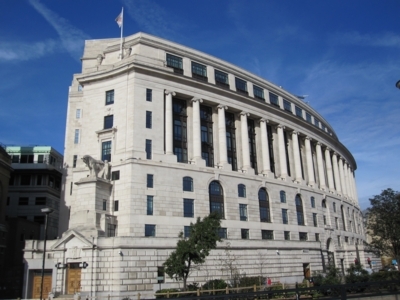 Unilever House is a Neo-classical Art Deco style Grade II listed office building constructed in 1933 for Unilever who still occupy part of the building. The office is located on the junction of New Bridge Street and Victoria Embankment and has a striking tall, curving frontage with giant Ionic columns which overlooks Blackfriars Bridge on the north bank of the River Thames. In 2004 the building underwent extensive internal modification and the parapet statues added in the 1970’s were removed. This building was constructed in 1930 in Fleet Street is known as Peterborough House. 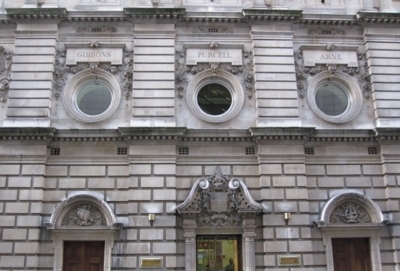 The neo-Classical façade is faced in Portland stone; it has a row of columns for its most prominent feature with a large rectangular clock suspended out from the building. The ground floor internally contains magnificent art deco decoration.The building is now occupied by Goldman Sachs. 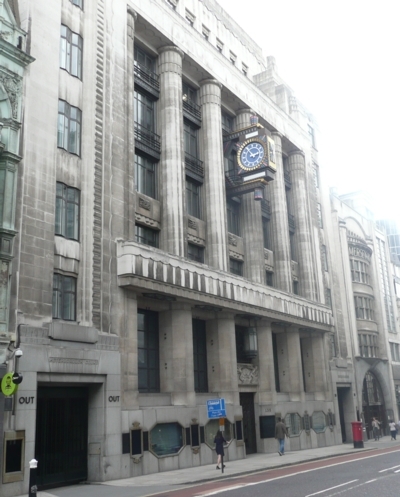 The Daily Express building was built in 1932 on Fleet Street and is close to the Telegraph building but is constructed in a very different style. 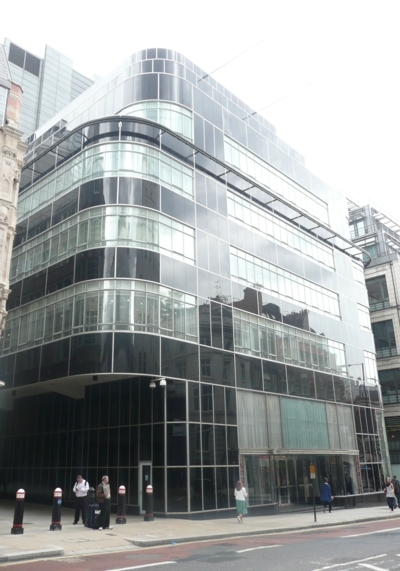 The exterior is a sleek shiny curving black monolith in glass, steel and vitriolite void of decoration.The building has one of Britain’s first curtain wall exteriors; this technique is used extensively for modern office buildings. The entrance foyer is visible from outside in the Street and contains magnificent Art Deco reliefs and decoration. The building is now occupied by Goldman Sachs. Situated on the north side of Queen Victoria Street near Blackfriars Station the original church was probably part of Baynard’s Castle and near the site where King Edward III housed his Royal Wardrobe. 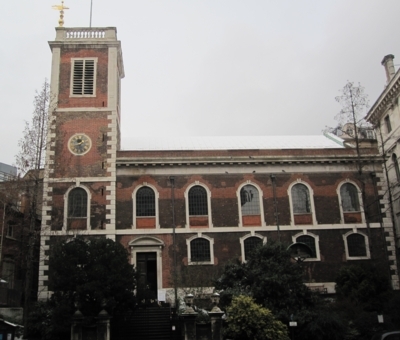 Both the Wardrobe and the Church were destroyed in the Great Fire and the current church was designed and built subsequently by Sir Christopher Wren in 1695. The Grade 1 listed church was badly damaged during the blitz and restored in 1961 using internal features obtained from other destroyed London Churches. The annual ward club Carol service is held in the Church. 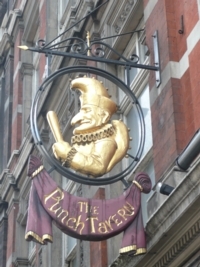 Fleet Street is the most famous thoroughfare in the Ward and is the spiritual home of the newspaper industry although most of the offices are now occupied by legal firms and banks. 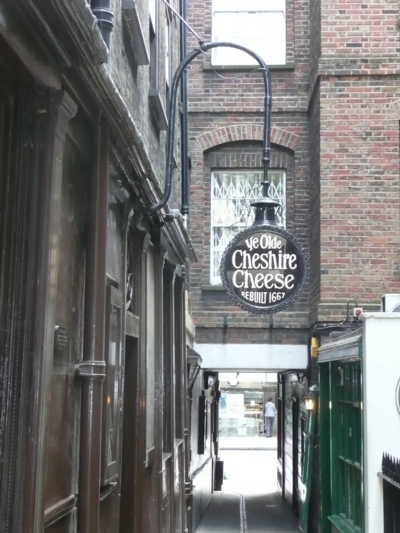 The street contains numerous infamous watering holes used by journalists during the heyday of Fleet Street; these include the Old Cheshire Cheese, Punch Tavern, The Tipperary and the Old Bell. A Grade II listed Victorian red brick and terracotta building constructed in 1894, housing the St. Bride’s Library which contains a collection of early printed books, typefaces, rare newspapers and an archive covering the history of printing. The nucleus of the library is the collection of printer William Blades, an authority on William Caxton. In 1994 the swimming pool inside the building was converted to use as a theatre. The library is part of the St Bride’s Foundation a charity which was set up in 1883 and today runs the Bridewell Theatre, Library, and holds lectures, educational visits and printing demonstrations.